On Wednesday night, Leroy Griggs hosted a teaching by Lama Jampa Thaye during his visit to Santa Monica, California. Leroy is a long standing member of the Los Angeles Buddhist community, having met Kalu Rinpoche in the 1980's and many other great Tibetan lamas. 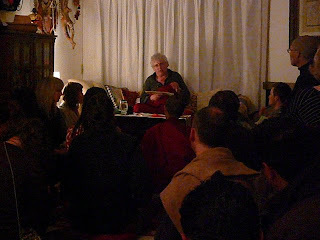 On this occasion, the second visit by Lama Jampa to Leroy's home, the selected teaching was the Green Tara initiation from Atisha's lineage, which Lama Jampa had himself received from Phende Rinpoche. Lama Jampa gave a detailed explanation of the principles and significance of vajrayana initiations according to an explanatory text by Zuchen Tsultrim at the outset of the ceremony, and then bestowed the initiation on the assembled Californians, and visiting Brits. After a short break, the Lama taught Jamyang Khyentse's sadhana of Tara, explaining the siddhis associated with each of the 21 Taras. In all, the teachings lasted about 3.5 hours, at the end of which Lama Jampa made a gift of the sadhana edition published by Ganesha Press to everyone present, encouraging and praising the practice of Tara.